I could have used one this morning! Amazon has Up to 40% off Philips Wake-Up Lights, Free Shipping with Prime or $49 order. Expires Today - All are rated 4 out 5 or better. Helps with SAD or Seasonal Affected Disorder. 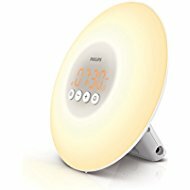 Philips Wake-Up Light with Sunrise Simulation, White $48.99, Next lowest price $77.